Saints Peter and Paul Russian Orthodox Church of Lakewood, Ohio, celebrated the joyous milestone of its 90th Anniversary with Vespers and Divine Liturgy for its Feast Day of June 29. A gala banquet was enjoyed the following day. Visiting clergy, dignitaries, parishioners and friends participated in all the festivities. 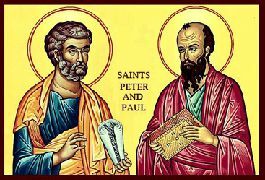 The early history of Saints Peter and Paul church is similar to that of most Orthodox parishes in the United States. Immigrants – mostly from the Sub-Carpathian Mountain region of what was then Austria-Hungary and western Russia – left their homeland, their beloved parents and family and immigrated to this country to begin a new and, hopefully, better life. They left everything behind except their love of God and devotion to their Faith. Although many of them had been farmers in their native country, in America they settled mostly in coal-mining regions and industrial areas such as Cleveland and its suburbs. After arriving, they not only maintained their culture and language, but sacrificed personal gain and erected their church before building their own homes so as to continue the spiritual legacy they had received from their fathers and mothers, the holy Orthodox Saints and Apostles, and their Creator. Today, as we think in retrospect of their sacrifices, our hearts are filled with praise and admiration for our forefathers, who had the vision and certitude to establish this church. On July 1, 1917, Father Joseph Tkach met with a group of people and organized a parish in the city of Lakewood. The Saints Peter and Paul Russian Orthodox Greek Catholic Congregation was founded and incorporated on July 19, 1917. The next year, Father Dimitrius Darin served briefly as pastor of the wooden church on Quail Avenue, but this proved to be inadequate for the newly established congregation. Under the pastorate of Father Michael Dziama, who came to the parish on August 11, 1918, the worshipers purchased the Madison Avenue property, where the church still stands. On October 19, 1922, the cornerstone of the edifice was lain by His Eminence, Metropolitan Platon. With great spirit and determination, these loyal people had planted the seeds of Orthodoxy in Lakewood. Father Michael Kostyk became rector on February 1, 1923; and during his leadership the congregation grew and the 870-pound bell was purchased. Although the income of the parishioners was meager, on July 27, 1925 – with fortitude and trust in the Divine – they undertook the task of building a new rectory and manually constructing the iconostas. On March 11, 1928, Father Vladimir Levkanich came to serve the parish and remained for approximately two years. Father George Barany was appointed pastor on July 1, 1930. Despite the depression and economic distress of country during this time, the parish flourished. The worshipers zealously participated in their cherished religious services, and the basement church was filled to capacity – even on holy days. During the six-year pastorate of Father Andrew Chernushin, talk began of building a new edifice above the basement church. Father John Obletiloff was assigned to Saints Peter and Paul on December 1, 1942, and remained until September 1, 1947, when ill health motivated his resignation. With the appointment of Father Stephen Rusiniak on September 1, 1947, plans for a new house of worship accelerated. A meeting was held on March 7, 1948, to draw up contracts to build the new edifice. With the generous assistance of the American Russian National Brotherhood, $500,000 was borrowed for the construction. Erection of the new church began on June 24, 1948, and was completed in June, 1950. On July 2, 1950, parishioners realized one of their greatest dreams when the dedication of the church took place. Growth of the flock continued, and parishioners renew their efforts to complete the church interior through donations of stained glass windows, pews, chandeliers, and other necessities. His Grace, Bishop John, officiated at a special ceremony to dedicate the altar and iconostas. Father John Miller who was to serve the Lakewood congregation for 29 years, served his first Liturgy here on May 4, 1959. During this time, the Council agreed to purchase 463 lots at Sunset Memorial Park Cemetery, and a monument was installed to identify the area. Nine years after the dedication of the new church – October 25, 1959 – the “burning of the mortgage” was joyfully celebrated, with the blessing of His Eminence, Archbishop John of Chicago. In 1984, parish members helped Mitered Archpriest John Miller celebrate the fiftieth year of his ordination; he retired three years later. After an interim period with a substitute pastor, Father George Breyan was appointed and served as rector until 1990. With the parish’s blessings and assistance, one of its own sons was called to serve our Lord in His vineyard; Father Andrew (Drew) Clements is presently rector of Saint Nicholas Orthodox Church in Mentor, Ohio. In July, 1990, Father John Adamcio was officially welcomed to Saints Peter and Paul Church. During his tenure, the church became a more visible presence in the community. This was accomplished in part by our participation in charitable food drives and festivals. Also, “Baba’s Kitchen” was established, comprised of parish men and women who cook, bake, and sell a variety of delicious foods, thereby preserving our ethnic culinary heritage. Father John served his last Liturgy in Lakewood on July 17, 1994, before moving on to his next parish. Father Dimitri Voytilla was officially appointed pastor on September 3, 1995, the position he fulfilled until just prior to his passing on July 7, 1997. For the next four months, several interim priests served as spiritual leaders. During that time frame, major renovations were done to the interior and exterior of the parish house. Father Timothy Sawchak served his first Liturgy as shepherd of the Lakewood flock on November 23, 1997. After announcing his intent to transfer, he served his last Liturgy at the Saints Peter and Paul altar on March 27, 2005. During Father Tim’s pastorate, rectory improvements continued. The main entrance was enhanced with stained-glass doors depicting our patron saints in life-size and a new outdoor sign were installed in a more conspicuous location. The parish website was created in February, 2000. Two years later, our Endowment Fund was established 0 which continues to grow and offer a unique opportunity to memorialize loved ones while securing the financial stability of the church’s future. In response to an appeal from “Baba’s Kitchen” for assistance, several caring, time-limited male parishioners formed what has become the strong right arm of the original group. They name themselves “Bubba’s Kitchen,” and their work party meets on Thursday evenings to supplement cooking and baking demands. Father Yves Babich was appointed the Church’s interim pastor on April 3, 2005, and become its official spiritual leader in March of the following year. He resides with his family in the suburbs. Recent inspirational additions to our house of worship include: exquisite matching Russian made banners – two gold and two green; a pair of stands specially building and installed in front of the iconostas to hold the icons and precious relics of Saints; and a beautiful new large floor cross, the corpus written by Father Yves and wood cut and prepared by a talented parishioner. The Church library offers a large collection of books for our spiritual enlightment. Our religious and ethnic “store” carries an excellent variety of meaningful items. Worship services utilize basically English, with a minimum amount of Slavonic to preserve the traditions of our forefathers. Coffee hours following Sunday Divine Liturgies are sponsored by various individuals who assume responsibility for serving the “goodies” that morning. This social break provides the opportunity to share fellowship with one another and to welcome visitors. Empathy for our fellow man remains highly visible in our small congregation. Humanitarian support is always extended when the need arises anywhere in the world, as well as in the vicinity. As in every parish, progress is impossible without its hard-working people and organizations. It would be remiss not to mentions ours: Saint Mary’s Altar Society, both “Baba’s” and “Bubba’s” Kitchens, the “R” Club, Men’s Club, Sunday School leaders, singers, readers, altar helpers, festival and event workers, the Church council, and all the other exceptional men and women volunteers who toil so selflessly to maintain the church and its surrounding property. Our generous parishioners, too, are overwhelmingly supportive and always rally to help achieve set goals. Much has been accomplished over the past nine decades, through the fortitude and self-sacrifice of the faithful of this parish. Despite stumbling blocks along the way, our spirit has remained unconquerable. As we thankfully celebrated our 90th year in 2007, as well as our 100th year in 2017, may the memories of all the faithful and pastors of Saints Peter and Paul Russian Orthodox Church who have gone before us, in the home of the Resurrection, be eternal … and may the Lord bless and enable us to proclaim and hold fast to our forefathers’ cherished beliefs of the True Faith. This is our sacred obligation.